With the election and the 2nd open enrollment period coming up, the timing couldn't be much worse, but Duty Calls and all that. There's a metric ton of ACA stuff going on; unfortunately I'll probably have to skip over about 80% of it for the next few days. Sorry! Yesterday I posted a whole slew of state-level QHP attrition rates, comparing the number of people currently enrolled in private exchange-based healthcare policies against the official number from back in April. The numbers ranged from as poor as Florida losing 12% of their enrollments in just 2 months to as well as Maryland and Oregon seeing a 30%+ net increase in enrollees over the past 6 months. Today I can add Kentucky to the latter list. She couldn't provide an exact current count, but according to the woman I spoke with at the kynect exchange (that's "Obamacare", Mitch! ), the number of Kentuckians currently enrolled in private policies via kynect is "right around the same number it was at last spring, between 80-85 thousand". The most depressing/enraging article you'll read today. Read the whole thing. Nothing more for me to add. Read more about The most depressing/enraging article you'll read today. Last week I crunched the numbers and pointed out that if the Republican Party ever successfully completes repealing the Affordable Care Act, tearing it out "root & branch" as Mitch McConnell is so fond of putting it, that 638,000 Michiganders would lose their healthcare coverage in one shot. Yup. We're up to over 646,000 Michigan residents who'd be pretty much screwed if the GOP gets its way. CoverOregon's Swan Song: Over half a million enrolled...manually. Read more about CoverOregon's Swan Song: Over half a million enrolled...manually. Read more about Well I'll be damned. Avg. QHP attrition really IS about 2% per month! Nevada: Lousy payment rate, but net attrition either decent or positive! I addressed Nevada's apparent attrition rate about a month and a half ago. At the time, it appeared to be a fairly ugly 7.7% per month...relative to the "high water mark" of paid enrollments they had achieved in July of around 38,000. However, since then I've realized that given the high amount of churn during the off-season as people enter and leave the marketplace, a far more accurate measure is the number of current enrollees relative to the April tally, since that was the "8.02 Million Total / 7.06 Million Paid" figure that everyone was focusing on anyway. Doing it this way is also far more consistent, since there's a hard 4/19 number to compare against for every state instead of it being all over the map. In the case of Nevada, I've just received word that the current number of people enrolled in exchange QHPs is exactly 32,460 as of mid-October. Read more about Nevada: Lousy payment rate, but net attrition either decent or positive! Indiana: Less than 1% net QHP attrition rate since April!! Rounding out today's "Net QHP Attrition Rate" Trifecta is Indiana, which, while not as deep-red as Tennessee, a) also has a Republican administration; b) hasn't expanded Medicaid; and c) refused to set up their own exchange. This makes it all the more of a positive surprise to see that their ACA exchange QHP attrition rate is even lower than Tennessee--in fact, it's under 1%!! The April 19, 2014 total for Indiana was 132,423 Hoosiers. Assuming an 88% payment rate and you get about 116,500. I just learned that the number currently enrolled as of mid-October stands at 115,800...a drop of just 0.6%. Read more about Indiana: Less than 1% net QHP attrition rate since April!! Tennessee: Only 5.6% net QHP attrition rate since April!! Excellent news!! I've posted exactly one (1) Tennessee-specific blog entry since I started this site a year ago, having to do with TN's possible caving on Medicaid expansion. Aside from that, I've had bupkus outside of the official monthly HHS reports during the First Open Enrollment period (OE1)...until today. Today I learned that the number of Tennesseans currently enrolled in QHPs (as in currently in-force policies) via the federal ACA exchange stands at 125,704. This is significant because the official 4/19/14 total for Tennessee was 151,352 people. Assuming 88% of the original number paid their premiums, that would be about 133,200 as of last spring, which means Tennessee has only had about a 5.7% net attrition rate over the past 6 months. Read more about Tennessee: Only 5.6% net QHP attrition rate since April!! Minnesota's exchange (called MNsure and pronounced to rhyme with "insure") has had it's share of technical problems, but they haven't been nearly as bad as the 4 state-run exchanges undergoing full overhauls (OR & NV are scrapping theirs entirely; MA & MD started over from scratch). They got hit with some bad news recently when the largest insurer on the exchange decided to bail, although that appears to have had more to do with that company's poor business decisions than anything on MNsure's side. However, they've continued to keep chugging along, quietly adding more enrollees to both private QHP policies (via qualifying life events) as well as Medicaid and MinnesotaCare (neither of which have any deadlines involved). Most relevant to myself, they're also the only exchange which has continued to provide consistent, regular enrollment data updates on a near-daily basis, which is manna from heaven from my POV. Kentucky: Mea Culpa: Turns out I had Mitch McConnell all wrong! For five months now, I've been trying to unscramble Kentucky Senate Republican Minority Leader Mitch McConnell's word salad about what his post-Obamacare-repeal intentions are for the people of Kentucky. He wants to repeal "Obamacare" "root and branch". "Obamacare" = the Affordable Care Act ("ACA"). In Kentucky, the Affordable Care Act (ACA) = "kynect". 527,000 Kentuckians rely on kynect for their healthcare, 75% of whom didn't have any other form of insurance before the kynect exchange launched last year. Repeal Obamacare > Repeal the ACA > Repeal kynect > Tear healthcare from 527K Kentuckians. Read more about Kentucky: Mea Culpa: Turns out I had Mitch McConnell all wrong! NY Times: Is the Affordable Care Act Working? Today's New York Times has a pretty in-depth overview of how the ACA is doing. Overall it's very well done, though I do have a few quibbles about the sub-header "After a year fully in place..." because the law hasn't been "fully in place" for a year now, mainly because the employer mandate portion doesn't kick in until January (and most of the SHOP small business exchanges haven't been launched yet either). Has the percentage of uninsured people been reduced? Answer: Yes, the number of uninsured has fallen significantly. Has insurance under the law been affordable? For many, yes, but not for all. Did the Affordable Care Act improve health outcomes? Data remains sparse except for one group, the young. Will the online exchanges work better this year than last? Most experts expect they will, but they will be tested by new challenges. Read more about NY Times: Is the Affordable Care Act Working? Back in 2003, when the second round of the utterly unnecessary Bush Tax Cuts were doled out (jacking up the federal deficit for decades to come), I received my very own check from the IRS for something like $300 or so. I distinctly remember that it had, typed in the lower left-hand corner, "TAX RELIEF FOR AMERICA'S WORKING MEN & WOMEN". As it happens, I donated the entire $300 to charity, since I had never asked for it and didn't want it. However, I always remembered the shamelessly partisan promotional nature of how it was done. A physical check with the actual dollar amount and a big, bold slogan referring to "relief" (the implication being, of course, that taxes are by their very nature a negative, awful thing which one needs relief from). When you think of the flu, the cost of getting sick probably isn’t the first thing that jumps to mind. But coming down with the virus can prove pricey. A visit to the doctor’s office can run $80 to $100—or more. If you need to head to the ER on a night or weekend for care, the tab can easily total $500. ...The good news is that you probably don’t have to pay a penny for the best defense against the flu. Under Obamacare, a flu shot is free as long as you have health insurance (though plans that were in place before the law passed in 2010, known as grandfathered policies, are exempt). It’s one of the preventive services that insurers must fully cover without charging you a co-pay or co-insurance—even if you haven’t met your annual deductible yet. Under Medicare, you also pay nothing. Thanks to Margot Sanger-Katz for bringing this KFF study to my attention; Tricia Neuman has done an interesting study to try and predict how many of the appx. 7.3 million current ACA exchange policyholders are likely to make the move from their current policy to a different one (either through the same company or a different one). Even after the disastrous rollout of the healthcare.gov web site a year ago, health insurance companies and providers of medical care are reporting more promising profits as third quarter earnings emerge. Gov. Gary Herbert announced Thursday that after months of negotiations, he has reached a final agreement with the Obama administration on his novel alternative to expanding Medicaid. "They are giving us more flexibility than has been given to any other state in America. We are breaking some new ground," Herbert announced in his monthly press conference on KUED. Herbert said he soon will send to the Obama administration a letter outlining the agreement they’ve reached on Utah’s alternative, his Healthy Utah plan. The deal would help low-income Utahns earning up to 138 percent of the federal poverty level who are not covered by Medicaid buy private health insurance plans. From the sounds of it, it looks like this will be set up along the lines of the Arkansas "private option" program, which basically amounts to using Medicaid funding to cover practically 100% of the cost of private QHPs. As we head into the final few weeks before the 2nd Open Enrollment period, it looks like MNsure is the only state which is left posting regular off-season enrollment updates. Things are definitely tapering off (only 113 new QHPs over the past 6 days & 3,294 added to Medicaid/MinnesotaCare), but that's still over 3,400 more people with coverage. Exclusive to healthinsurance.org: Is Obamacare 'in hiding' until after the election? For my latest exclusive to healthinsurance.org, I take a look at the recent USA Today Op-Ed by Robert Laszewski. Read more about Exclusive to healthinsurance.org: Is Obamacare 'in hiding' until after the election? Even the Heritage Foundation admits net uninsured population dropped by over 8.5 million as of June 30th! Read more about Even the Heritage Foundation admits net uninsured population dropped by over 8.5 million as of June 30th! Well isn't this a breath of fresh air!! WASHINGTON -- Democratic Sen. Jeanne Shaheen refused to shy away from Obamacare on Tuesday in the first televised debate of the New Hampshire Senate race. Shaheen, one of several vulnerable Democrats up for re-election in November, forcefully defended the health care law moments after Scott Brown, her Republican opponent, said he would fight to repeal it. When specifically asked if Obamacare was a proud achievement, Shaheen responded, "Absolutely." "I think making sure that almost 100,000 people in New Hampshire have access to health care is real progress for people in this state," Shaheen said. Many Republicans are caught in a quandary when it comes to the Affordable Care Act. They hate the fact that a black Democrat implemented their own law nationally, they hate poor people getting healthcare coverage at little cost to them and they hate middle-class people getting healthcare coverage at a price they can afford. However, they love getting elected/re-elected. So, what's a good Republican candidate to do? Well, for Mitch McConnell, many GOP Governors and other Republican candidates, the answer seems obvious: Repeal the Affordable Care Act nationally while at the same time changing the laws at the state level to increase eligibility to the same 138% FPL (Federal Poverty Level) threshold included in the ACA. ...It is an open question how expanding Medicaid benefits as generously as the Affordable Care Act allows, to adults earning up to 138 percent of the poverty level, could be paid for without increased taxes and Medicare cost reductions also created by the health care law. Read more about HA HA HA HA HA HA!! Last week I announced that I've started writing occasional pieces for HealthInsurance.org. Today they've published my 2nd entry, which is all about Kentucky, Mitch McConnell and the real-world impact on hundreds of thousands of people that repealing the ACA would have. UPDATE: In my story, I noted that the Federal Government is picking up 100% of the tab for the expanded Medicaid enrollees for the first 3 years, and then thought that it dropped down to 90% for another 6 years, and then to the normal fed/state split after that (70/30 in the case of Kentucky). Thanks to David M. for bringing to my attention this correction: The expansion program is an even better deal for the states than I thought, because apparently the Federal share only drops to 90% permanently (well, unless a future Congress messes around with that provision of the ACA, of course). There's been a lot of fuss made about 2015 ACA exchange premium rates not being available at Healthcare.Gov until after the election. The presumption, of course, is that this is being done for political reasons. While this may be true, it could also simply be that there's a lot of different policy figures to plug into the federal system, and some states haven't even finalized their rates yet. IDAHO: Idaho is the only state moving from HC.gov to their own exchange. Idaho residents can check out their 2015 rates directly via the state exchange site. CALIFORNIA: CoveredCA has 2015 rates available right now as well. New York: Amazingly detailed interactive enrollment map of NYC...by zip code! This is absolutely awesome...and extremely frustrating at the same time. Dan Goldberg and his chums at CNY have put together another extremely detailed breakdown of ACA enrollments in New York City, with QHPs, Medicaid and CHIP enrollees sorted out by individual zip code (a pretty herculean task given how many zip codes there are in NYC). Even more interesting (from my perspective, anyway) is that they've managed to get the current enrollment figures--updated through September. Since the NY exchange pointedly informed me back in June that they had no plans to release updated enrollment figures during the off-season at all, this is a huge development from my POV. The only problem, of course, is that this map only gives the tally for NYC itself (about 8.4 million people total) not the rest of the state (about 19.6 million). Since my data is focused on the state-level numbers, this is frustrating; so close, and yet so far. I suppose I could extrapolate the numbers by multiplying each by 2.3x, but that doesn't work because the demographics are so vastly different between the two. Read more about New York: Amazingly detailed interactive enrollment map of NYC...by zip code! Regular readers may recall my thorough debunking of Sharyll Attkisson's ludicrous claim that only 3.4 million people out of the "38 million" who are "eligible for coverage under Obamacare" have actually received healthcare coverage since the law went into effect. As I noted, these numbers were just a wee bit off. The "3.4 million" is actually more like "11.8 million", and while the "38 million" is actually reasonably close if you're only including those who were a) uninsured last year and b) who qualify for either Medicaid or tax credits via the ACA exchanges (more like 36.4 million), even this is stupid because no one in the Obama administration, HHS, CMS or the CBO ever claimed that all 36.4 million would be insured in the first year of the exchanges. Research has shown that consumers "do think there is a difference," between for-profit and not-for-profit health plans, says the head of an industry group. But in the final rule on health insurance exchanges, CMS has declined to require that tax-status be disclosed. Nonprofit health insurance plans continue to dominate customer satisfaction and quality lists, and they want consumers to know about it. Bruce McPherson, president and CEO of the Alliance for Advancing Nonprofit Health Care, says federal and state health insurance exchanges should do more to make the tax status of health plans readily available to consumers. CLARKSTON, WA – Leaders with Washington’s Health Care Exchange are preparing for the second open enrollment period, but at the same time they are still working on resolving billing and computer problems for 1,300 accounts from the first sign-up period. Commissioner Nick Gerhart said today that he has approved premium increases from Wellmark Blue Cross and Blue Shield, CoOportunity Health and Coventry Health. The 343,000-person expansion in Medicaid enrollment this year is nearly three quarters of the 466,000-person expansion-eligible population estimate by the Kaiser Family Foundation. But the 161,775 residents who enrolled through the marketplace are equal to just over one quarter of the estimated 628,000 eligible. The other noteworthy thing here is that according to my own breakdown of the KFF estimates, New Jersey only has around 562,000 uninsured eligible for tax credits via the ACA, not 628K. However, this is mostly moot since those with insurance can also purchase QHPs via the exchange as well if they wish, so it's not really that big of a deal. As for the 161,775 QHP figure, that dates back to last spring, so no update there. A couple of days ago, in response to my debunking of Mitch McConnell's litany of lies about the Affordable Care Act, I posted a letter from a Kentucky resident who gave his view of the situation. Mr. Gaba, I am also from Kentucky. I appeciate your fact checking of McConnell on the ACA and in most instances I would say that you are correct and he is not. That said, I work in health care and we have also seen a boon in our bottom line due to decreased uncompensated care and bad debts. We are also in a poor county and almost 80% of the people were Medicaid recipients including some of my family members, so the ACA, at least in the short term has benefited us. Read more about Kentucky: A Republican Responds. The Health Insurance Marketplace, Medicaid, and Children’s Health Insurance Program (CHIP) are critical in ensuring coverage for many individuals. As of August 15, 2014, 7.3 million Americans were enrolled in Marketplace coverage and had paid their premiums. This number represents a snapshot of a point in time, not the cumulative enrollment data from October 2013 through August 2014. Arkansas: Number of people Tom Cotton wants to run over 10,000 higher than I thought. The other day I noted that Republican Congressman Tom Cotton of Arkansas, currently in a heated battle with U.S. Senator Mark Pryor to take Pryor's seat, is proposing not only stripping healthcare from the 200,000 people in his state who have gained healthcare this year thanks to the Affordable Care Act's Medicaid expanion provision (the "private option" in AR) as well as 40,000 people who are paying for policies via the ACA exchange, but is going even further by pushing for half of the pre-Obamacare Medicaid/CHIP budget to be slashed. This would effectively result in up to 20% of the state's entire population losing their healthcare coverage...every one of whom is either poor or barely middle-class at best. Read more about Arkansas: Number of people Tom Cotton wants to run over 10,000 higher than I thought. The gross attrition rate has been only 1.6% per month, and the net attrition rate since April is an astonishingly low 1.8% over 6 months, or just 0.3% per month, which is far better than anyone (including myself) had imagined. Basically, people being added are almost entirely cancelling out people dropping coverage. The list of technical improvements, new features, beefed-up staffing and ramped-up outreach efforts for the 2nd open enrollment period included in the press conference was extremely impressive (see the lower half of this entry from earlier today). HOWEVER, there was one key data point which was quite surprising and disappointing to me: The initial payment rate. OK, I've started a new entry since the last one was getting pretty long. I projected the total California QHP enrollment figure to be around 1.68 million. The actual number is 1,414,668 (as of 4/15...see update at bottom of this page) plus 200,000 off-season enrollments from 6/1 - 9/30 plus an unknown number from the 46 days between 4/16 - 5/31. I have no idea why they left those 46 days out of the press conference. Very odd. There were 200,000 people who enrolled from June 1st - September 30th (122 days), or 1,639 people per day. Assuming the missing 46 days saw a similar rate to the rest of the off-season period, that would be 1,639 x 46 = 75,394 additional enrollees. That would make my projection 99.4% accurate. Regular readers know that given the HHS Dept's going radio silent on the total ACA enrollment figures since the last official report was released back in May (which only ran through April 19th), I've been patching together bits and pieces of enrollment data from a handful of state exchanges, plus the occasional snippet of info from other states which has managed to find daylight from time to time. Based on this, I've been projecting roughly 9,000 QHP enrollments being added per day during the off-season, translating into around 270,000 per month, of which about 90% eventually pay their first months premium. That translates to around 240K paid enrollees being added per month, which in turn is being roughly cancelled out by people dropping their policies after the first few months as they move on to other types of coverage (Medicare, ESI, Medicaid and so forth). Based on these estimates, there should now be a gross total of around 9.6 million enrollments, of which around 8.3 million have paid their first premium, and around 7.4 million who are currently enrolled as of October. As of April 19th, 79,192 people in Connecticut had enrolled in QHPs. Since their non-payment rate has been "in the single digits" (call it 8%), that means around 72.8K paid enrollees as of then. If there are currently 74,334 enrolled, that means there are 2% more enrolled (and paying) today than there were 6 months ago, which is right in line with my projections as well as the national 7.3 million figure mentioned by HHS Secretary Burwell as of August. Arkansas: My God. Tom Cotton proposes tearing healthcare coverage away from up to 20% of the state. First, I just want to take a minute to note that over the past year, I've discovered that while there's lots of good reporting on the ACA nationally, there are certain states which have one particular person who's the "go to" journalist for all things Obamacare-related. Read more about Arkansas: My God. Tom Cotton proposes tearing healthcare coverage away from up to 20% of the state. 15,110 people enrolled in private health plans through the DC Health Link individual and family marketplace. 14,486 people enrolled through the DC Health Link small business marketplace. 31,175 people were determined eligible for Medicaid coverage through DC Health Link. That's an increase of 708 QHPs, 627 in SHOP policies and 1,983 in Medicaid. 450,000 — which is 306,000 + the 100,000 or so people who are still in subsidized Commonwealth Care plans and another 33,000 or so residents who buy insurance through the Connector. The state has estimated that 50,000 adults are eligible either through the state's managed care program for Medicaid or through a program that subsidizes existing employer coverage. Hassan says 20,035 have signed up since July 1. Washington State: Net attrition rate just 5.1% since April! According to the last official HHS enrollment report from back in May, as of April 19, 2014, Washington State had enrolled 163,207 people in private policies via their ACA exchange. Of those, 8,310 people never actually had their coverage start due to non-payment (WA requires payment of the first month's premium as part of the enrollment process, so I'm not sure what happened in these cases, but presumably there was some sort of credit card account approval glitch, insufficient funds in debit card accounts and/or the like). In any event, that means the actual paid tally as of 4/19 was 154,897, or 95%, which is pretty darned good. Read more about Washington State: Net attrition rate just 5.1% since April! Read more about Residents of Kentucky (and every other state) should read this. Obamacare enrollment tracker Charles Gaba calls the House report "embarrassingly flawed" and, with uncharacteristic bluntness, a "pile of crap." For starters, returning customers will have to use the old, 78-screen application. New customers can use a simpler, faster, and more streamlined 16-screen version. Health and Human Services officials said the site will automatically fill in existing consumers' information, such as their address and income, to help speed them through the process even though they have to use a more cumbersome application. That makes sense, as long as consumers take the time to change pre-populated information that has become outdated. Boy, this syndrome of Republicans seemingly forgetting that repealing Obamacare would mean that hundreds of thousands of the very people they're hoping will vote for them would have their shiny new healthcare coverage torn away from them seems to be spreading fast. I'm calling it "repealnesia". First it was Joni Ernst, who wants to castrate 100,000 or more of her fellow Iowans by cutting their healthcare coverage out from under them with no plan on how (or whether) to replace it. Then it was Kentucky's Mitch McConnell, who popped his head out to play an Obamacare-ACA-kynect shell game last night. Yeah, I did a takedown of Mitch McConnell last night which gained some traction. However, that was more of a rant. Today, let's take a look at just how many times he flat-out lied about the Affordable Care Act (aka "Obamacare", aka "kynect"), shall we? (Moderator Bill) Goodman: has Obamacare and kynect been a boon or a bane for Kentuckians? Senator? Mcconnell: Kentucky kynect is a website1. It was paid for by a $200 million and some-odd grant from the federal government. The website can continue. But in my view, the best interest of the country would be achieved by pulling out Obamacare root & branch and let me tell you why. Announcement: My first article for healthinsurance.org! Since 1994, healthinsurance.org has been a guide for consumers seeking straightforward explanations about the workings of individual health insurance– also known as medical insurance – and help finding affordable coverage. The topic of insurance can be confusing, but we’re here with more information than ever: educational articles, expert health policy analysis, frequently asked questions about reform, a health insurance glossary, and guides to the health marketplaces and other insurance resources in each state. I can't think of another publication outside of this one where what I do here is more appropriate. Looking at the list of other contributors, I'm honored to join their company. My debut contribution to healthinsurance.org is an update regarding the citizenship/immigration data situation for Covered California enrollees...and the implications it may have for the rest of the country. Please take a look! Read more about Announcement: My first article for healthinsurance.org! In addition to running ACASignups.net, I also happen to be a website developer by trade. I founded my website development company 15 years ago, which makes me an old man in the industry. Given both of these capacities, I think I'm in a pretty good position to judge what's "just a website" and what isn't. The kynect "just a website" wouldn't exist without Barack "Yeah, He's Black And He's The President Of The United States, It's Been 5 1/2 Years So Get Over It Already" Obama and the Democratic Party. Those are two of the findings of a survey released today by the Center for Outcomes Research & Education at Providence Health Services. The goals were to understand who enrolled, assess their connection to care before and after enrollment and to understand their health. At the time of the study, 76,569 Oregonians had signed up through open enrollment. Colorado's official monthly metrics report is out, and shows that while off-season QHP additions have started to drop off as we approach the 2nd Open Enrollment period, they're still within my estimated range of 20-25% of the on-season rate. Meanwhile, SHOP enrollments have inched above the 2,500 mark to sit at 2,517 covered lives as of the end of September. On the one hand, I've been expecting the daily QHP enrollment rate to drop off nationally as we approach November 15th; anyone who isn't truly desperate for coverage is likely to hold off at this point even if they do have a qualifying life event, given the numerous changes in companies, policies and rates which are going to be available. On the other hand, my "9,000 per day" estimate has always been a bit closer to the low end of the range (7,900 - 10,500 per day at the moment), so I have some wiggle room in this final month anyway. Michigan: Republicans would kick 650,000 people off their healthcare policies. Here's the good news: The "Healthy Michigan" program, Michigan's name for ACA Medicaid expansion, is up to over 415,000 enrollees, or 87% of the total eligible for the program. Hooray!! Now here's the bad news: If the Republican Party has their way, every single one of those people will have their brand-new coverage yanked away from them...along with an additional 240,000 or more people (including myself) who are enrolled in private policies thanks to the Affordable Care Act. Combine the two, and that's over 650,000 Michiganders who will be royally screwed if Republicans get their way, or over 6.5% of the entire population of the state. Read more about Michigan: Republicans would kick 650,000 people off their healthcare policies. Read more about Kentucky: Will Mitch McConnell seriously propose a $700 Million tax increase on Kentuckians tonight?? UPDATE: He did it!! Not exactly the most shocking headline, I know. Around 26,000 Iowans are privately insured via the ACA exchange (assuming the standard 90% paid their first month's premium) , plus another 80K - 100K via Medicaid expansion. A query from a viewer said he had received health coverage through the Affordable Care Act. To Ernst, he asked, "Have you given any thought to how individuals in my situation won't lose coverage, should repeal occur?" Ernst called Obamacare a "job killer" in Iowa that is "taking personal health decisions out of our hands and placing them with nameless, faceless bureaucrats in Washington, DC." That is to some degree true, but what about the guy's question? It was a reasonable concern; millions of people are now receiving subsidies to purchase health insurance. If Republicans repeal Obamacare, what happens to them? Let's fire up the Wayback Machine® and revisit March 19, 2014, shall we? ...A few days ago, I broke the cardinal rule of blogging and social media: I fed a troll. Specifically, I engaged in a back & forth with a guy who insisted that I don't have any clue what I'm talking about, that I "don't cite my sources" (insane, since every one of my sources is meticulously cited, dated and linked to)...and, in particular, that I'm "lying" about the number of California residents who have "fully" enrolled in exchange-based QHPs in California (and by extension, nationally). If you check the recent Disqus comments you'll see him pop up a few times today. At first, he was arguing the "But how many have PAID???" line, which I've repeatedly addressed. Interestingly, he was finally willing to (grudgingly) concede that yes, around 85% of "full enrollments" have indeed been paid to date. In Kansas, yes, insurance companies were allowed to bump out non-compliant plans by at least a year...and indeed, Blue Cross Blue Shield of Kansas ended up not cancelling "between 9,500 - 10,000" of their policy holders after all. So...that basically wipes out half of the "20K cancelled" claim already. ...That pretty much leaves BCBS KC and the other 10K. Based on the evidence at hand, my guess is that they likely reversed their cancellation decision as well...and if they did, that means that the actual number of Kansans who lost their healthcare policy in 2013 due to ACA noncompliance may have actually been as little as...ZERO. Anyone who knows me, or who reads the FAQ (which is to say, hardly anyone), knows that I've never tried to hide my personal political views. I'm a proud progressive, active in the local Democratic Party, and have taken plenty of shots at Republicans here at ACASignups.net. However, I've tried very hard not to let that skew the data I report, and I've also taken plenty of shots at both HHS and/or the various ACA exchanges when they screw up. Case in point: Just this morning I noted that the Vermont exchange is sending people to their website to pay bills when the site has been offline for weeks, and Oregon's disastrous exchange continues to provide embarrassment with news that they enrolled U.S. Senator Jeff Merkley--himself a proponent of the law--in Medicaid and somehow assigned him 97,000 children. In any event, when I do go off-topic from time to time, it's generally for something innocuous. Thanks to Jed Graham for bringing up an interesting point about the 2015 renewal-vs-new-enrollee issue earlier today. His original point was that it's likely going to cause no end of headaches (especially to me) to try and keep track of the enrollment figures since there's going to be around 7.5 million existing enrollees to contend with (most of whom, I would hope, will renew their policies) plus the newly-added enrollees whose policies start in January or later. Any 2014 plan you enroll in with a Special Enrollment Period ends December 31, 2014. This is true no matter what month in 2014 your coverage starts. I usually feel more pride in correctly predicting stuff than this. In any event, you can expect a slew of new "OMG!! X MILLION POLICIES CANCELLED!!" attacks this fall as well...just before the midterms. It's not so much that this is false--some policies will be cancelled--as heavily exaggerated, along with the "impact" of those cancellations (most people will do exactly what my wife and I did...simply replace the old policy which isn't compliant...with a new one which is compliant and offers more comprehensive coverage...in many cases at a much lower rate after tax credits are applied, as long as they enroll via the ACA exchange instead of directly via the company). Remember that when you start seeing the campaign attack ads with absurdly ominous music playing over black-and-white footage of someone reaching into the mailbox and pulling out...a notice from their insurance company (DUN-dun-dunnnnn...). Read more about I usually feel more pride in correctly predicting stuff than this. The Obamacare lawsuit which has nothing to do with Obamacare...mostly. Jon Fougner says his simple search for a doctor through the insurance company website turned into a ‘Dickensian nightmare.’ Some doctors did not accept new patients, others never returned his calls, and some had wrong contact information listed on the Empire BlueCross BlueShield website, he claims. He accuses Empire of breach of contract, fraud and false advertising. Read more about The Obamacare lawsuit which has nothing to do with Obamacare...mostly. Read more about Kentucky: McConnell goading Grimes into saying the "O" word. Here's a simple response. GOP Senators threaten to shut down Gov't over Obamacare...AGAIN. These jackasses just don't know when to quit, do they? A year after shutting down the government, a group of Senate Republicans are pressuring House Speaker John Boehner (R-OH) to oppose any funding bill in the lame duck session that includes appropriations for a small program contained in the Affordable Care Act, potentially triggering another showdown. Read more about GOP Senators threaten to shut down Gov't over Obamacare...AGAIN. I had to visit HC.gov for the first time in months today to check on something and was impressed by the mostly new interface and overhauled layout. Obviously a lot of the content changes are connected to prepping for the 2nd Open Enrollment Period (lots of "get ready!" and "upcoming deadlines!" and the like), but right off the bat I saw one important improvement: It's finally responsive. That is to say, HC.gov is finally optimized for smartphones & tablets. the health insurance website will feature a streamlined application for most of those signing up for the first time. Seventy-six screens in the online application have been reduced to 16, officials said. Slight News: Dem Candidate publicly supports ACA. Big News: In South Dakota. Really Big News: So does his formerly-Republican opponent! In an election where people like me are practically begging Democratic candidates in blue states to campaign on the Affordable Care Act, this is a jaw-dropping development. South Dakota's Senate race normally would be considered a yawner. While the state does have a history of electing the moderate Democrats from time to time, it's pretty red for the most part, and no one was expecting Democrat Rick Weiland to have much of a chance against former Republican Governor Mike Rounds. However, in an interesting development, independent candidate Larry Pressler has jumped into 2nd place in a recent poll. The thing is, Pressler isn't some no-name small timer; he's already a former U.S. Senator, serving for 3 terms before losing to Democrat Tim Johnson in 1996. With Johnson retiring, his seat is open, and Pressler wants it back, so he's jumped back into the game. Here's the thing, though: Pressler used to be a Republican. In South Dakota. Read more about Slight News: Dem Candidate publicly supports ACA. Big News: In South Dakota. Really Big News: So does his formerly-Republican opponent! Gallup has just released their latest nationwide, fully-detailed quarterly insurance survey, and the results are...pretty much exactly what everyone in the real world (as opposed to FOX News, etc.) has been reporting for months now. The total U.S. population currently sits at roughly 316 million. Of that, around 76.7% are over 18, or about 242 million people. 18% of that is 43.6 million. 13.4% is 32.4 million...a net reduction of around 11.2 million uninsured, or about a 26% drop in the uninsured rate nationally. Tax exemptions: I was told there would be no math. WASHINGTON (AP) — Millions of Americans may qualify for waivers from the most unpopular part of President Barack Obama's health care overhaul. But getting that exemption could be an ordeal. Community groups are concerned about a convoluted process for waivers from the law's tax penalty on people who remain uninsured. Not everyone is complaining, however: Tax preparation companies are flagging it as a business opportunity. The law's requirement that Americans carry health insurance remains contentious. Waivers were designed to ease the impact. Oh noes!! Not MATH CALCULATIONS!! Aieeeeeeee!!! Read more about Tax exemptions: I was told there would be no math. (sigh) When I posted about Wal-Mart (yes, that Wal-Mart) embracing the ACA exchange system by opening up enrollment kiosks staffed by licensed brokers in 2,700 of its stores, some people were understandably suspicious of their motives. Wal-Mart told The Associated Press that starting Jan. 1, it will no longer offer health insurance to employees who work less than an average of 30 hours a week. The move affects 30,000 employees, or about 5 percent of Wal-Mart's total part-time workforce, but comes after the company already had scaled back the number of part-time workers who were eligible for health insurance coverage since 2011. By an amazing coincidence, January 1st just happens to be the same day that new ACA-compliant policies purchased during the 2nd open enrollment period kick into effect. ...metal level/plan design, age, and geography, on health insurance plan premiums. At present, certain states are only reporting partial information about next year’s rates, and others are only reporting percentages that rates will change without sharing actual premium data. Unless otherwise noted, only individual health insurance filings containing rate information have been included in this analysis. Read more about Six Percent. The most-recent CMS report, which only runs through June 30th, gave the net gain in Medicaid/CHIP enrollment as around 7.2 million, plus an additional 950,000 people who were added to Medicaid due to ACA provisions prior to October 2013. That's 8.15 million total over pre-ACA numbers. There's two important points to keep in mind, however: First, again, that only ran through 6/30/14; there's been 3 solid months of additional Medicaid/CHIP enrollments since that time; and second, as of September there was a backlog of over a million people still waiting to be processed and added to the Medicaid/CHIP roles (1/3 of this in California alone). I have no idea how much of this backlog has since been cleared up, but if CA's improvement rate is anything to go by, my guess is that most of it should be out of the way by the time the 2nd open enrollment period kicks in on November 15th. Note that I'm not really even bothering to keep the Off-Season Projection Chart updated anymore; we're close enough to the 2nd Open Enrollment period that it seems a bit silly to bother (heck, I've already projected the graphs out through 11/15 anyway). BOSTON - With the next open enrollment period set for Nov. 15, Gov. Deval Patrick on Monday said the state's troubled health care exchange website is fixed, at a cost of an additional $26 million to the state, bringing the federal and state total to $254 million in information technology costs. ...Consumers who log onto the Health Care Connector website will have a "full end-to-end shopping experience" for health plans on Nov. 15, Patrick said. Is *your* state extending non-compliant policies for a 2nd year? Read more about Is *your* state extending non-compliant policies for a 2nd year? A simple cost comparison using data from the Medical Expenditure Panel Survey illustrates why Medicaid expansions can substantially affect premium prices for private insurance plans. Under national health reform, community rating regulations apply to purchases made on state exchanges by both individual consumers and small employers. In 2011, the health care costs of individuals getting insurance in these ways averaged $4,300 (with lower costs for the healthiest among them). By contrast, health care costs for nonelderly adults on Medicaid averaged $8,300 (even though Medicaid pays low rates to hospitals and physicians). If all Medicaid beneficiaries were shifted to the exchanges, prices for each purchaser would go up by more than $1000. NEW YORK (AP) -- Wal-Mart is taking one-stop shopping to another area: health insurance. The world's largest retailer plans to work with DirectHealth.com, an online health insurance comparison site and agency, to allow shoppers to compare coverage options and enroll in Medicare plans or the public exchange plans created under the Affordable Care Act. Wait, what's that?? Wal-Mart, the poster child for cold, heartless, maximize-profit-at-all-costs capitalism is going to start helping people enroll in that "socialist Obamacare" insurance?? How can that be? Why on earth would they do that? Read more about Idaho: CURRENT PAID QHPs 78K, 14% *higher* than in April! Read more about Virginia: Jerk ex-state Senator's daughter offered job improperly by BOTH parties over Medicaid expansion?? A couple of weeks ago I noted that for the 2015 Open Enrollment period, the (completely overhauled) Maryland exchange will not only be easing into their new website in several stages over several days (first allowing enrollments by phone, then letting brokers/navigators into the website, then health/social service dept. employees, and finally the general public), but they're also going to allow comparison "window shopping" starting 6 days before the official launch date, to give people extra time to figure out what policy they want to sign up for before actually purchasing it. Then, a week ago I noted that Idaho--the only state moving from HC.gov to their own in-house exchange website for Year Two--is going one step further by opening up comparison shopping on October 1st...as in, 4 days ago. That's right, if you live in Idaho you can go kick the tires and pick out your plan if you wish right now at YourHealthIdaho.org, though you'll still have to wait until 11/15 to actually check out and complete the process. VINDICATION: California QHPs Updated At Last: CURRENT PAID QHP enrollments 8% HIGHER than in April! G'mar Hatimah Tovah. Yes, I know I shouldn't be posting this on Yom Kippur Eve, but this seemingly minor news item means volumes to me personally. I've spent 5 solid months pain-stakingly piecing together the best projection I could for off-season exchange QHP enrollments, using bits and pieces of data from a dozen or so states...mainly Minnesota, Oregon, Hawaii, Colorado and Washington State. In the absence of official updates from Healthcare.Gov (36 states) or the 2 largest state-run exchanges (California and New York), however, I was never completely sure about how close I was to the actual number, since the data I did have only covered perhaps 8% of the population. Still, I eventually gave up hope that either NY or CA would bring their numbers up to date, forging ahead with my overall estimate of roughly 9,000 additional QHP enrollments being added daily during the off-season, 90% of those paying for their first month's premium, and roughly an equal number dropping their coverage sometime later...meaning that at any given time during the off-season, roughly 90% of the April 19th "official" number would be likely to still be enrolled and paying up. Read more about VINDICATION: California QHPs Updated At Last: CURRENT PAID QHP enrollments 8% HIGHER than in April! More than 81,000 Marylanders had enrolled in private health insurance on the state’s health exchange as of Sept. 20, officials said Friday. That’s an increase of 2,425 individuals since August. At the end of September, 376,850 people had gained Medicaid coverage during 2014. That’s an increase of 21,569 over the past month. However, over the past year, some people have been dropped from the Medicaid rolls. People can become ineligible for the public insurance program if their income increases or if they experience other changes, like in age or household status. So, the net increase in Medicaid enrollment compared to December 2013 is 262,979 people, according to officials with the Maryland Health Benefit Exchange. Over 10M private sector jobs created since "Obamacare" signed into law. Read more about Game. Set. Match. Minnesota officials say the average rate for policies sold on the state health insurance exchange next year will go up 4.5 percent. But, they say Minnesotans will still have access to the lowest average rates in the nation. The five companies participating in the exchange range from dropping their averages by 10 percent to hiking them more than 17 percent. They declined to say which companies are raising rates and which are lowering them. BluePlus joins Blue Cross Blue Shield, HealthPartners, Medica and UCare this year. Unfortunately, not only is there no way of doing a weighted average here since the current enrollees for the various plans aren't listed, I can't even post which companies are increasing or decreasing their rates. Ah, well. Read more about In which "OMG!! GAZILLIONS OF POLICIES CANCELLED!!" turns out to be...not so much. Michigan Republicans ask people to harass 91 year-old bedridden woman in hospice. This story is beyond disgusting. The Michigan Republican Party has mailed out a hit piece on John Fisher the Democratic candidate for Michigan’s 61st House district. The mailer asks the recipient to call a phone number to complain about Fisher’s support of the Affordable Care Act. The number they give rings at the bedside of Fisher’s mother, 91-year-old Isabel Marie Kramb, who is in hospice care with congestive heart failure. Read more about Michigan Republicans ask people to harass 91 year-old bedridden woman in hospice. In which Megan McArdle lays out a quite rational argument for voting for Democrats in November. The Affordable Care Act includes several reinsurance programs that were supposed to help insurers mitigate the risk of mispricing their policies as they ventured into the strange new world of selling insurance on the government exchanges. The administration is leaning hard on these programs to keep insurers in the game, allowing payments out to be higher than payments in, and otherwise substantially reducing the potential losses that insurers can experience when selling exchange policies. ...The GAO responded that the payments are indeed legal, but for them to be legal again in 2015, the appropriations language for 2015 would have to be similar to this year’s language. Read more about In which Megan McArdle lays out a quite rational argument for voting for Democrats in November. 2014 Congressional candidate campaigns ON Obamacare. In Kentucky. VERY nice find from contributor Britt M. This article is from back in April...how have I not heard about this woman before?? But even as Obamacare found its sea legs nationally and boasted solid first enrollment numbers in recent weeks [reminder: article is from April], it still came as a surprise to local political watchers when a Kentucky Democratic congressional candidate picked up the ACA baton and used it to bash the GOP incumbent that she is challenging. Elisabeth Jensen, the presumptive favorite to take on Lexington Congressman Andy Barr this November, emerged last week as the first federal candidate in the region—and one of only a few in the entire country—to broadcast a campaign ad championing health care reform, and attacking her opponent for voting more than a dozen times to repeal it. Read more about 2014 Congressional candidate campaigns ON Obamacare. In Kentucky. Read more about Irony Alert!! "Euro/Socialist" Switzerland rejects Single Payer in favor of....Obamacare!! OK, this isn't particularly dramatic given that I've already projected the cumulative total QHP figure to hit around 9.9 million by November 15th, but it's still nice to mark the occasion of another milestone being hit. 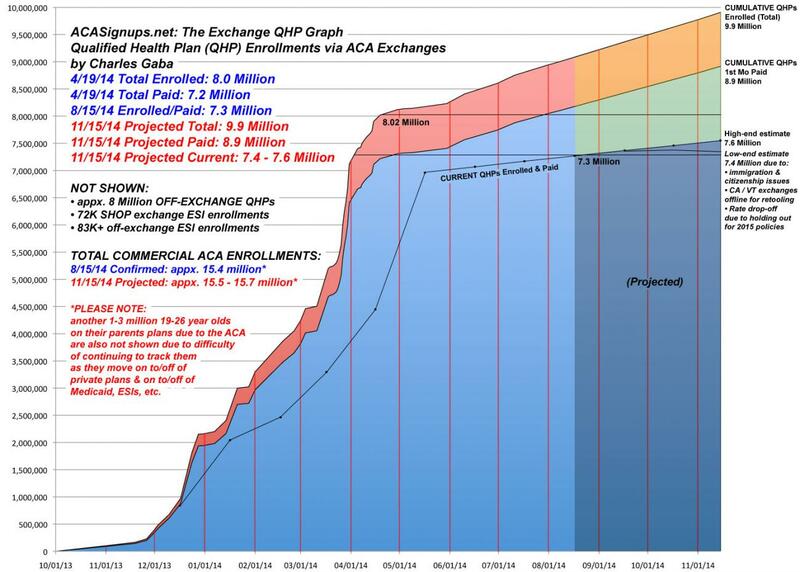 By my best estimates, assuming 9,000 people enrolling in private Qualified Health Plans via the various ACA exchanges every day during the off-season, the grand total should have hit the 9.5 million mark right around midnight last night. The video also coincides with the release Tuesday of new data by Quinn’s administration that showed 468,000 people enrolled in the expanded Medicaid program since last year, more than double original forecasts. SPRINGFIELD — Newly surfaced video of Republican Bruce Rauner obtained by the Chicago Sun-Times shows him telling conservative activists in Lake County last year that, as governor, he would have blocked Gov. Pat Quinn’s 2013 expansion of Medicaid. When the ACA open enrollment period ended for 2014, approximately 16,000 Alaskans had purchased individual health insurance plans, with nearly 9,000 receiving federal subsidies through the Federally Facilitated Marketplace. The official HHS report gave Alaska's number as 12,890 as of 4/19...this is 24% higher than that. The first thing which crossed my mind is that the 16K figure might refer to the current gross enrollment figure, which should indeed be about 18% higher than it was in mid-April nationally. However, the fact that the article itself is an extremely anti-ACA screed by the Alaska Commerce Commissioner makes me pretty confident that she wouldn't try to make the actual enrollment numbers any better than they actually were. About 157,000 Ohioans signed up for health plans through the federal exchange during the first open enrollment period, which ran from Oct. 1, 2013 into March, 2014. In January, Ohio expanded Medicaid under Obamacare to cover more low-income adults. More than 360,000 people have already enrolled around the state through that new eligibility. And most of the doom and gloom predictions about the Affordable Care Act haven’t come true. Premiums aren’t through the roof, and the website, pretty much works as the federal government prepares for a new round of open enrollment starting Nov.15. Again, pretty minor stuff, but as we enter the 2nd year of the ACA exchanges being open (slightly different from the 2nd open enrollment period, of course, which doesn't start for another 6 weeks), I figure it's a good idea to get some little details up to date. Republican U.S. Senator Pat Roberts is scrambling for his political life after the Kansas Democratic Party pulled off a clever maneuver by deliberately dropping out of the race in order to shore up support for independent challenger Greg Orman (who may or may not caucus with the Dems, but would still be a huge step up from Roberts). Anyway, Roberts has gone on the attack against Orman with a rather lame attack ad trying to paint Orman as an Obama/Pelosi/Ultra-Leftie Liberal, bla bla bla. New Mexico projected that Medicaid expansion would sign up 219,000 new enrollees over a six-year period. In the first year alone (2014), they have already signed up 155,000, 71% of the best-case six-year estimate.